In 2001, Swarovski began producing small zodiac figurines, but it was not until 2003 that they produced the first Swarovski Zodiac Rabbit. Last year (2010), the crystal company produced two more Chinese Zodiac Rabbits. 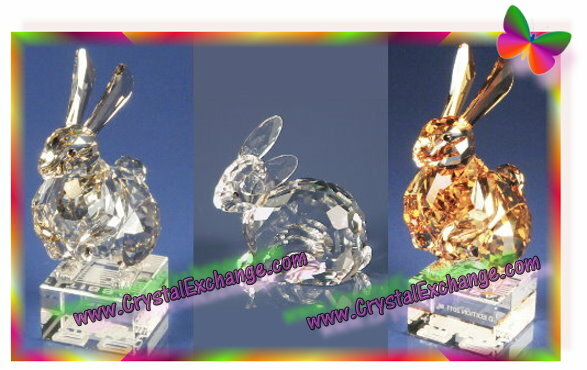 This exclusive article by the Kristall Buzz contains information and contrasting features about the zodiac Swarovski Rabbit figurines produced by our favorite crystal brand. Swarovski Zodiac Rabbit – The first zodiac rabbit was a part of the Swarovski Silver Crystal product line, in the “Chinese Zodiacs” theme group. This zodiac rabbit is on the smaller side, measuring about 1.25” in height. The Swarovski identification numbers are 7693 000 009 / 622 845. It was designed by Anton Hirzinger. The zodiac rabbit was introduced in 2003 and it retired in 2005. This zodiac rabbit originally retailed for $60. In 2010, Swarovski released two more zodiac rabbits. These rabbits are larger and are in the “Chinese Zodiacs” collection. Both 2010 releases measure about 4.25” in height. Both are mounted on a clear crystal base. Underneath, the clear base in engraved in matte finish with an English and Chinese seal script. 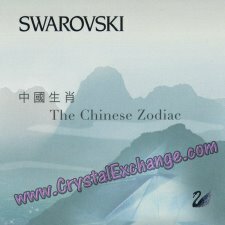 These Zodiac figurines are the result of a collaboration between Swarovski and CAFA. Swarovski Chinese Zodiac Rabbit – The most common Chinese Zodiac Rabbit can be identified using Swarovski’s part number and system number: 9100 000 190 / 1 046 179 . The color is silver shade. It retails for $300. Swarovski Limited Edition Chinese Zodiac Rabbit – The other rabbit is the Chinese Zodiac Rabbit, Limited Edition. The Swarovski identification numbers are Limited Edition – 9100 000 192 / 1 046 377. The color for this figurine is golden shine. It has the inscription ‘Limited Edition 2011’ in the base. This limited edition figurine was available in China, Taiwan, Hong Kong and Macau October, 2010 – January 2012. Being a limited edition, this figurine also includes a special certificate. Check out the Kristall Buzz article: Swarovski Certificate of Authenticity for Chinese Zodiacs for more information on the certificate. You are a Rabbit if you were born in these years: 1951, 1963, 1975, 1987, 1999, or 2011 (add or subtract 12 years to continue the pattern). You Rabbits can google ‘chinese rabbit personality’ for more information on personality traits and characteristics.